What seemed like a Kryptonite ray causing Supergirl to fall to her death was actually a weapon fired by someone pretending to be Cat Grant. The real Cat is giving a speech promoting CatCo, and the laser has caused Kara Zor-El's powers to overload. Even as Kara Danvers, she can't do the smallest thing without causing a superhuman incident. Ben Rubel covers for her. Perhaps he suspects Kara is Supergirl? Whatever the case may be, the Lost Daughter of Krypton must find a way to reduce her power levels before she becomes a danger to herself and others. Kara is discussing her plight with Zor-El, who is in suspended animation while his daughter and the D.E.O. try to find a way to help him. In the meantime, Emerald Empress has taken some hair from Solomon Grundy while he's locked up and asleep in Arkham Asylum. Together with Indigo, Selena, Magog and a clone of Grundy, they make up an all-new Fatal Five who believe a future version of Supergirl will destroy them. They have every intention of preventing that, even if it means killing the Girl of Steel and wreaking havoc in National City. The Fatal Five has set its plan to get Supergirl into motion. D.E.O. 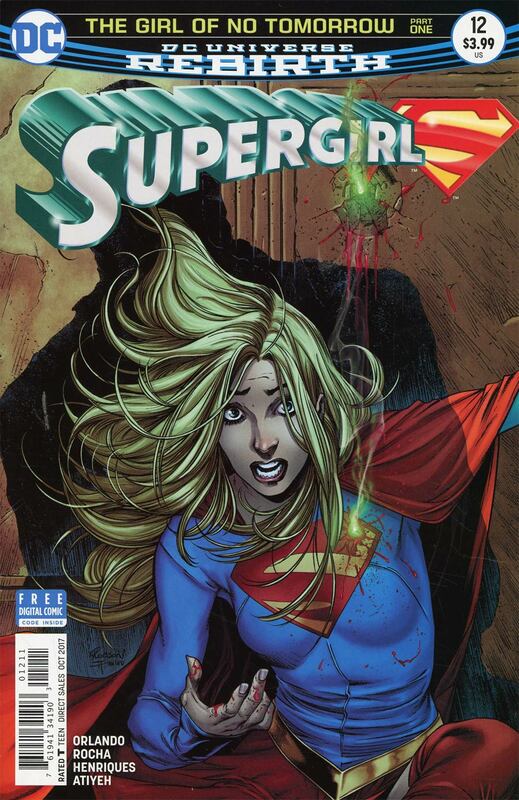 Director Chase is attacked by Emerald Empress while Cat Grant is held prisoner by Selena. Still not in control of her powers and feeling the air numb as it was when she was shot by "Cat," Kara goes into action finding Grundy rampaging through National City. Will she prove to be more dangerous than her foes in the Fatal Five if her power levels don't return to normal? Will the Fatal Five succeed in destroying the Maid of Might? The next chapter holds the answers to those questions and so much more. Be here, same Super Time, same Super Site, Superfans, to find out what this quintet of villains has in store for Kara Zor-El. Story - 5: This issue starts at a lightning pace right out of the gate. Steve Orlando blended some brilliant character moments with superhero action and adventure. I had my doubts about this book when it started with that god-awful "Reign of the Cyborg Supermen" serial. However, they've been quelled with the past few issues, including this one. I'm especially curious about the future of Supergirl as told by Emerald Empress. This is one of those nuggets of mystery right up there with the identity of the Hobgoblin in 1980's Spider-Man comics. Perhaps I'm either dating myself or going too far, but this hole plot thread has me curious about what will happen to Kara as this and future arcs progress. The bottom line is you really have to pick this one up. If you've never read this title before, now is the time to start. Art - 5: Finally some art that works for this series. I do have issues with coloring of page one's shooting scene after issue #11's last page used green instead of the purple used in #12. That feels like someone wasn't paying attention in editorial. However, this should not reflect on the visuals in the book. The images are amazingly drawn and a treat to look at, making this comic an all-around joy to read. 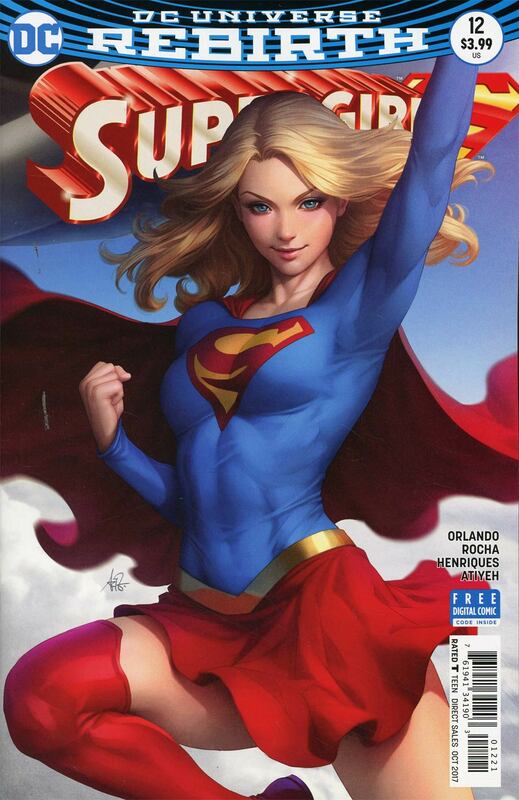 Cover Art - 5: The cover gives a feeling of grave danger for Supergirl, making one want to buy the book. Plus, the art is incredible. More covers like this one, please.